The preliminary results from a Nevada trucker survey aimed at parking and other issues now has the attention of transportation leaders. Nevada trucking advocates have called the critically low number of available, legal parking spaces for big rig trucks a crisis . Nevada Department of Transportation and other stakeholders have been working to address the concerns of tired truckers with a new freight transportation plan, which includes a yearlong survey from truckers. 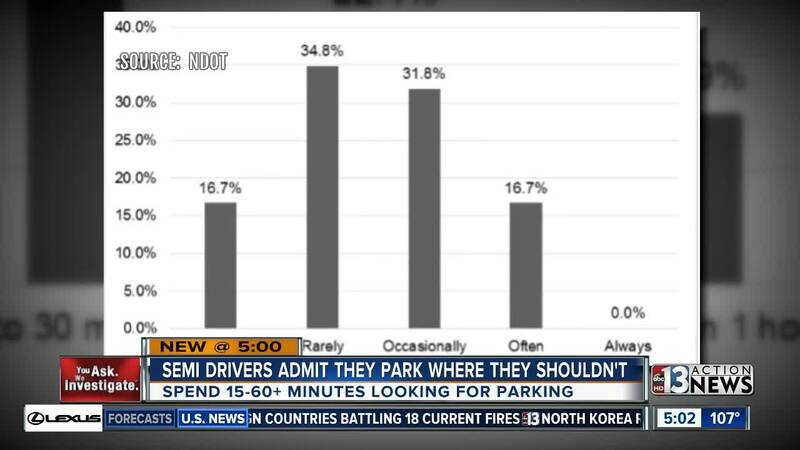 The survey shows many truckers spend anywhere from 15 minutes to more than 60 minutes trying to find parking in Nevada. The American Transportation Research Institute survey also revealed nearly 32 percent of truckers who responded, admitted they occasionally park in "unauthorized locations" while 16.7 percent admit they often do it. The Nevada Department of Transportation says truckers need to take federally-mandated rest breaks to avoid drowsy driving. Officials say the survey gives an eye-opening look at the parking problem. "It is helpful in that regard, to gauge the concerns along with the time it takes drivers to find a parking facility," said Tony Illia from the Nevada Department of Transportation. Contact 13 has reported several Las Vegas neighborhoods have become " pop-up truck stops " for tired truckers, blamed in large part to the lack of available commercial parking. The survey shows interstates 15 and 80 as the worst offending roadways when it comes to available parking, they also rank 1 and 2 respectively for the amount of truck traffic in Nevada. The survey highlights some solutions such as more public and private truck stops with amenities plus additional parking in urban settings. Project leaders expect to have a final plan together in 2019.